The dB Blocker™ Communicate Ear™ allows for in-ear radio reception as well as exceptional hearing protection. It is custom fit to the individual wearer for maximum comfort using Skinsoft™ medical silicone. It is suitable anywhere two-way radio communication is used, and as it is dual vented, the Communicate Ear™ will enhance interpersonal communication in noise as well. dB Blocker™ Communicate Ear™ hearing protectors are usually paired with a dB Blocker™ Classic or Grip in the opposite ear. The dB Com™ Communicate Ear™ allows in-ear radio reception as well as exceptional hearing protection. It also allows in-ear radio reception as well as exceptional hearing protection. It is custom fit to the individual wearer for maximum comfort using Skinsoft™ medical silicone. It is suited to anywhere two-way radio communication is used, and as it is dual vented, Communicate Ear will enhance interpersonal communication in noise as well. The dB Blocker™ Communicate Ear™ is a hearing protector that is actually comfortable to wear. Most hearing damage arises when an ear plug is removed for conversation and comfort. The dB Blocker™ Communicate Ear™ is made to fit the individual’s ear exactly and stay in place without pressuring the ear so comfort is not an issue. This gives the worker a product that provides effective hearing protection and stays in the ear all day long. 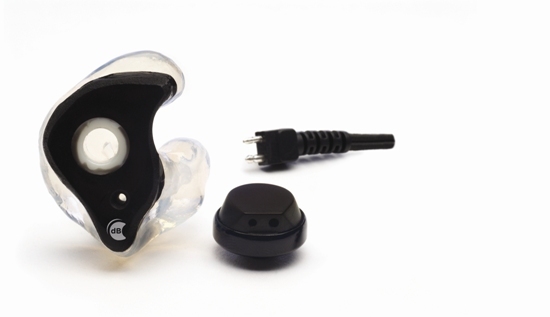 The dB Blocker™ Communicate Ear™ contains a proprietary frequency-tuned filter that allows the wearer to hear localized sounds (such as buzzers and alarms) and enhances interpersonal communication, as well as a connection for a receiver button to provide clear radio connectivity. In fact, people can communicate in noise better while wearing their dB Blockers™ than if they were to remove them. The dB Blocker™ Communicate Ear™ hearing protector (earplug) was designed for persons who work in and out of noise. They are ideal for executives and supervisors who visit the factory floor infrequently and do not need to communicate while in a noisy workplace. With a comfortable fit and the ability to communicate with a dB Blocker in place, workers will comply with the Hearing Loss Prevention Program. Using the dB Blocker will enhance compliance with the hearing protection program. This protection can be worn for a complete shift, without the need to remove it to talk on the phone, eat lunch, or relieve pressure. 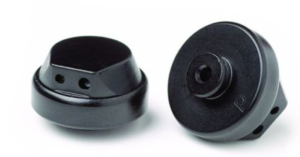 Anytime a hearing protector is removed, even for a short period of time, you are exposed to damaging noise. Noise exposure is cumulative.